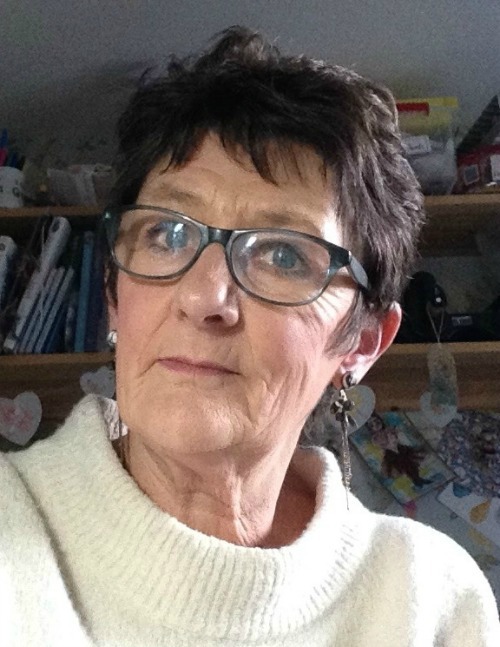 Hi everyone, Nikki here to introduce our guest designers who were selected from a previous challenge as the Creative Guide favourites - our Pinworthies! 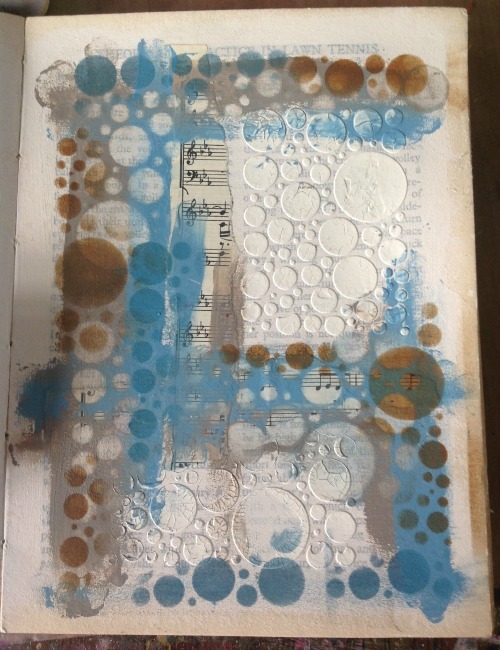 Today we welcome Mo and Hazel to share a project on this month's challenge theme - Stencil It. Hi Everyone, My name is Mo and I live in a beautiful part of Norfolk, England near the coast with my hubby Alan and our gorgeous rescue dog 'Georgie'. I have always enjoyed making things since I was a little girl, my style tends to lean towards the Vintage/Shabby Chic side of things and I love experimenting with mixed media. I don't usually plan my projects in advance, I just like to go with the flow and see where my imagination takes me. My Wanderlust Journal cover was in desperate need of some tlc as it was just a rather drab Kraft cover, far from inspiring so I thought this was a perfect opportunity get out my stencils paint and texture pastes to brighten it up. I lost count of quite how many stencils I used on my cover, but there were quite a few. I just took a paint colour and stencil, then changed the paint colour and used a different stencil building up the layers. Next came texture paste, again I used different stencils and different colours of paste. As you can see I kept the back cover a little less decorative but still matching the front up to the finishing touches. I used a wash of paint colours over the crackle paste and as you can see it settled nicely into the cracks. I used Distress Rock Candy crackle paste all over the Journal to seal the Artwork and to give it a good hard protective coat. Here also you can see some of the inked and stamped vintage ribbon on the spine along with organza ribbon used off the peg. Hi, I'm Hazel Agnew, and I am thrilled to be asked to add my contribution as a guest designer here on "A Vintage Journey". I have been crafting since I retired from work around 8 years ago, and have wandered through just about every medium on the planet. I love to draw and have grown in confidence with lots of practice. I particularly enjoy messy crafting and work spontaneously...never quite knowing where my creations will take me. Here is my piece for the project entitled 'Stencil It". I confess to this being my second effort as I tried too hard on the first one! 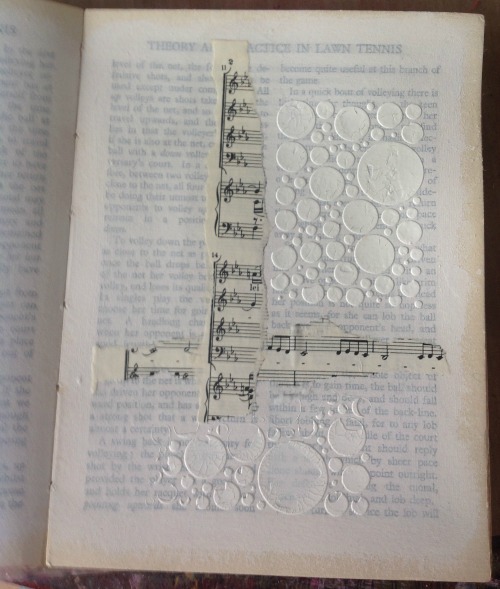 Step One:- I selected a page in my ancient Girls Annual and gessoed the page. I added some Deco Art crackle paste through a small stencil by Thats Crafty and pasted a little manuscript. Step two:- Next, I applied some Paperatsy frescos, Sky and Taupe, using my fingers, and before they were dry I rubbed off some circles of paint through the same circles stencil. 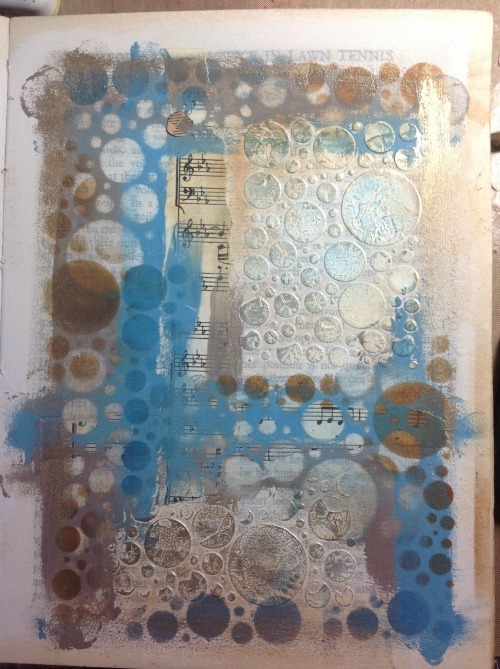 I then added some contrast circles by stencilling the same circles with a foam pad and archival inks in Coffee and Cornflower Blue. 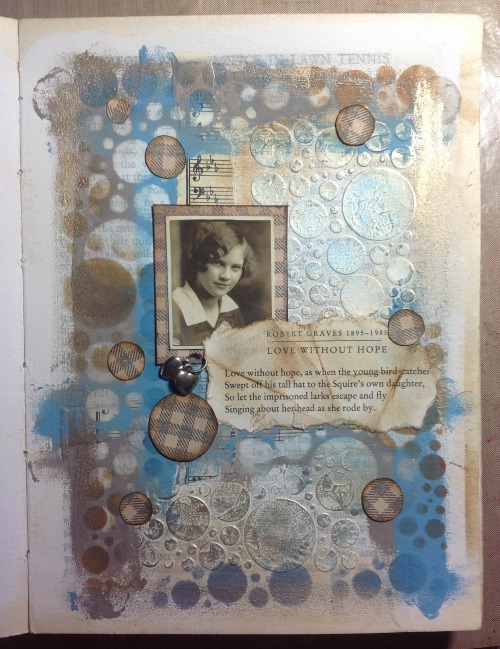 Step three:- I darkened the crackle paste circles by rubbing over with a vintage photo ink pad and added more interest by adding Treasure Gold in Sapphire and White Fire. Step four:- My last injection of the circular stencil was to draw circles through it onto patterned paper. I cut them out and arranged them onto my composition. I also added a photo chosen from Tim Holtz Photo Booth and a poem selected from a poetry book bought at the local charity shop. In my story, the girl is very young and flirtatious and she dabbles in waters that are dangerous for her. A young man is smitten and is tormented by the fact that she is beautiful and too young for him.....he is noble and gallant and decides that sense will prevail over his feelings, hence, the photo and poem about "Love without hope". A little love token just finishes off the sad love story that never was! I hope that you have enjoyed my post and seen that there are many ways to use a stencil. 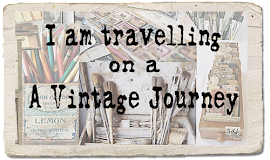 Thanks to A Vintage Journey for asking me to contribute and if you want to see more, my blog is "Mellifluous Meanderings". And just for the record, here is my first effort that was overworked. Thanks for looking! Thank you Mo and Hazel for creating these fabulous projects for us today. Our Stencil It challenge is open until the end of August - do come and join in. 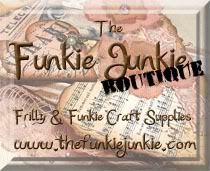 Fantastic creations from two brilliant crafters - now that's what I call inspiration! Fabulous stenciled themed projects Mo and Hazel offering lots of inspiration of how to create with stencils . Thank you so much for sharing them with us and Congratulations on your Guest design spot today . These are fabulous Mo and Hazel, I do love vintage too. 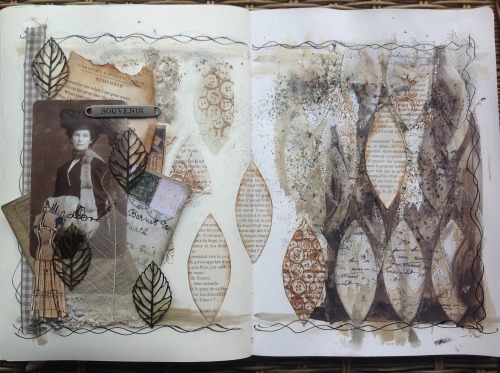 Both Mo and Hazel have provided beautiful inspiration with their stenciled projects! Great to see them both featured here as Guest Designers--congratulations, ladies! I love that you both create from the heart and are spontaneous with your work! Hugs! These pieces are both fabulous ! I love them ! 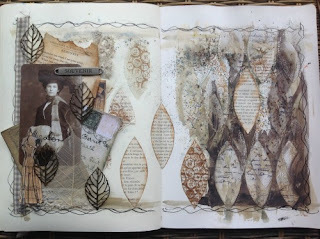 Both Mo and Hazel have created beautiful stenciled projects, absolutely gorgeous!!! Wonderful inspiration from both guests! This is so pretty! 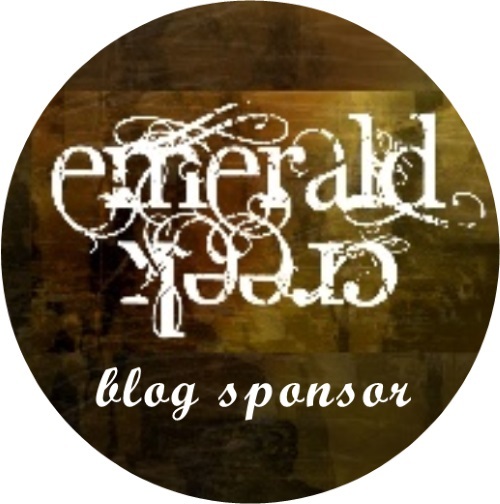 love the idea :) Thanks for sharing with us!